Looking for an unusual but striking tropical office plant that you will not see in the big box stores? Consider one of the many species of Aralia. These elegant and interesting plants can be a bit tricky to care for, but in the hands of a professional interior landscaper, they can be a unique addition to a plantscape. The three most common species are the Ming aralia (Polyscias fruticosa), Balfour or Dinnerplate aralia (Polyscias balfouriana) and the Chicken gizzard aralia (Polyscias crispatum). Aralias are slow growing plants that are available in many forms and sizes. 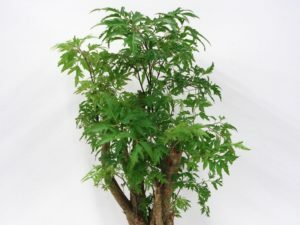 Ming aralias are often sold as bonsai table-top plants. Larger aralias are usually Chicken Gizzard or Balfour species and can be anywhere from 3-7ft in height. These plants are multi-stem, and take on very unique shapes as they grow. Aralias tolerate medium light, but prefer good, indirect light. Good drainage is critical, as the roots will rot easily. Use a very light, highly porous soil. This plant needs to be kept slightly moist at all times. Issues with leaf drop are usually related to humidity; aralias will not tolerate dry air. They can handle high temperatures, as long as the humidity is high as well. When the environment is too dry, spider mites can quickly become a problem. Regular pruning is important to keep the foliage full. New leaves regenerate quickly from cut branches. Fertilize regularly from early spring until late fall.